creamy | This Girl’s Gotta Eat! 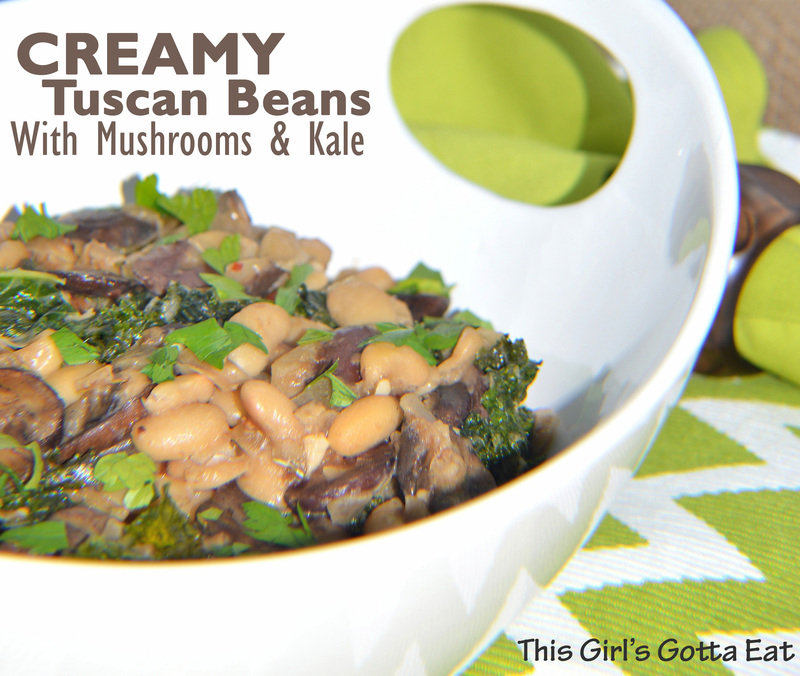 This rustic Tuscan bean side dish is deliciously creamy and loaded with both flavor and nutrition! It whips up pretty quickly too. Get some chicken or steak on the grill while you prepare this, and before you know it you’ll have a lovely weeknight meal ready to enjoy. In a medium saucepan, heat a few Tbsp of oil over medium-high heat. Add onion and cook until beginning to soften, 3-5 minutes. Add garlic and cook until fragrant, stirring, a minute or so. Add rosemary, red pepper flakes and just a pinch of salt. Next add the mushrooms and cook until beginning to brown, 5 minutes, stirring occasionally. Add beans, stock, olives and cheese. Cover and simmer for 15 minutes, stirring occasionally. The cheese will melt nicely into the stock, creating a nice creamy dish. Meanwhile in a large saute pan, heat some oil and saute kale until wilted and cooked, 5-10 minutes. You can make as much as you like, I filled the pan (remember it shrinks when it cooks). Transfer sautéed kale to the beans and finish cooking together the final 5 minutes, stirring occasionally. 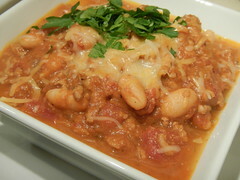 Dish out beans, top with parsley and enjoy alongside a protein of your choice. I served with grilled chicken breasts. This creamy dressing is delicious and healthy, the key is to use Greek yogurt rather than mayo (typically found in creamy dressings). Packed with flavor, it’s a great dressing for just about any salad. Featured here has southwestern components, such as corn, red onion and tomatoes. 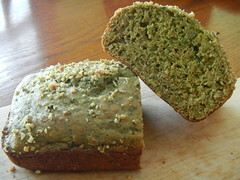 In a food processor combine yogurt, lemon zest and juice, parsley, garlic, salt and pepper to taste. While the food processor is on, stream in the oil and vinegar. Taste, and adjust seasoning and oil to your liking. To make the salad pictured above: place mixed greens in a large bowl, season lightly with salt and pepper, mix gently with some of the salad dressing. Divide among plates. In the same large bowl, combine toppings such as corn, red pepper, onion, tomatoes and cucumber; and mix in a little more of the dressing. Divide dressed, chopped veggies on top of the tossed greens. 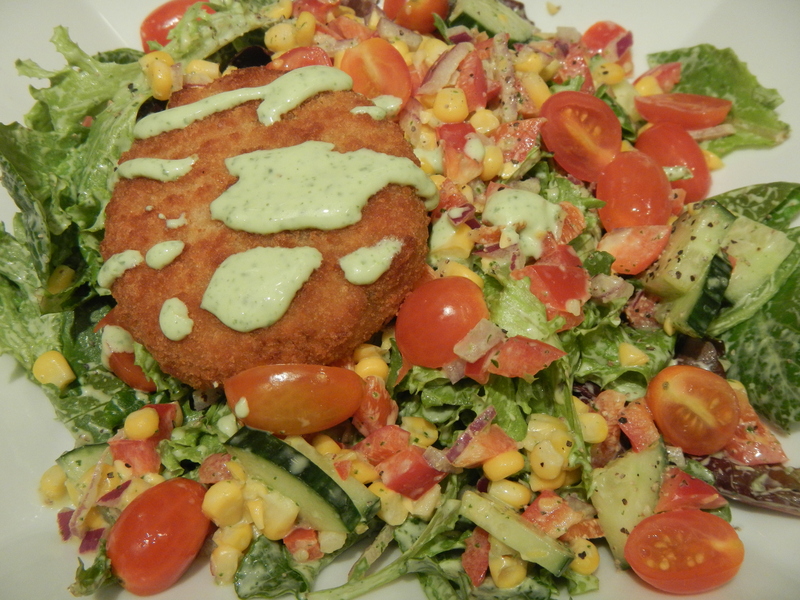 Serve the salad as is for a meatless option, or top with a baked crab cake (pictured above) or chicken. Drizzle protein with a little more sauce. Heat large heavy pot over medium-high heat. Add a little olive oil and the pork, breaking up in pieces. Saute over medium-high heat until it starts to get a golden brown color. Add 2 more Tbsp olive oil along with the carrots, celery, onions and garlic. Stir in the bay leaf and season with salt and pepper, to taste. Cook the veggies until soft, about 5 – 6 minutes. Add the tomato paste and stir for 1 minute, then add the wine and cook for another minute. Next stir in the stock and bring sauce to a simmer. Next add a pinch of ground cloves (this really gives a nice depth of flavor). When the sauce returns to a simmer add the milk and reduce the heat to low. Let the sauce mellow for about 30 minutes, stirring occasionally. After about 30 minutes, start the polenta. Bring milk and broth to a boil in a saucepan over medium-high heat. Slowly whisk in cornmeal, reduce heat to low and simmer until thick, 5 minutes, whisking constantly. Off heat finish with parmesan and a little salt. 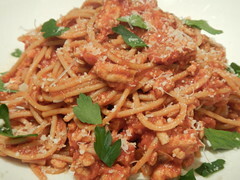 You can make the pork ragu ahead of time and reheat over medium-low heat. You may need to add a splash of water or stock when you’re reheating the sauce to thin it out a bit. Serve the sauce atop the creamy polenta and garnish with lots of cheese and parsley. Roulade is a French term for a cut of thinly pounded meat with a filling rolled inside. These beauties make a big impact in both flavor and looks….give them a try when you’re sick of eating the same tried and true recipes! Dice 6 olives; set aside. Process remaining 6 olives, bread crumbs, tomatoes, zest, garlic and oregano in a food processor until minced. Using a meat mallet, pound chicken between plastic wrap to a thickness of 1/4 inch. Spread olive-tomato filling on chicken (spread within 1/4 inch of the edge of the chicken). Roll chicken to enclose filling, starting at one short end; secure with toothpicks. Saute roulades in oil in a large nonstick skillet over medium-high heat until browned, 4 minutes. Remove roulades to a plate. Add onion to the skillet; saute 2 minutes. Add wine; cook until liquid is reduced by half, 1-2 minutes. Add broth. 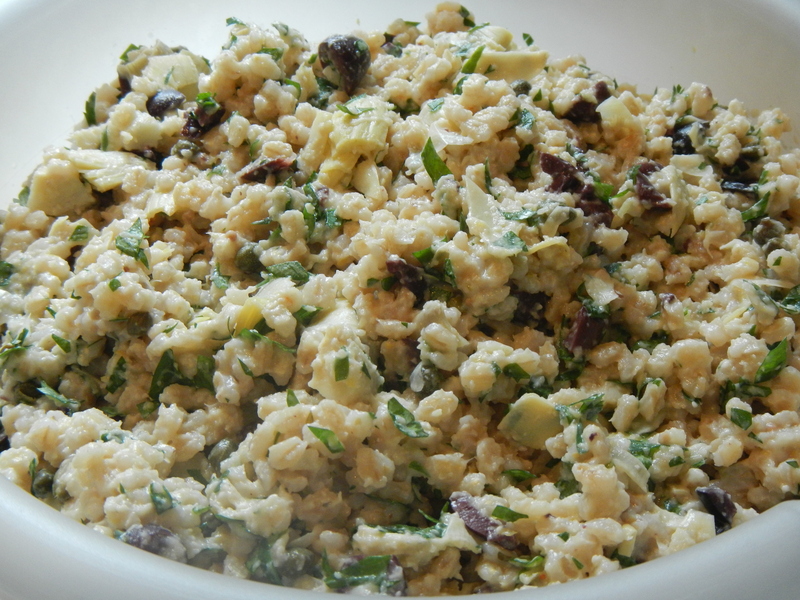 Bring mixture to a boil; add reserved diced olives and roulades. Cover skillet; reduce heat. Simmer roulades 10 minutes; remove roulades to a plate. Whisk together lemon juice and cornstarch; stir into sauce in skillet. Simmer about 1 minute, stirring constantly until sauce thickens. Remove toothpicks, then slice roulades; serve with sauce. Start boiling broth in a saucepan for the orzo before making the roulades, then finish the orzo dish while the chicken simmers. When the broth is boiling, stir in orzo. Return liquid to a boil. Cook orzo, uncovered, stirring occasionally, until the liquid is absorbed, about 9 minutes. Remove saucepan from heat. 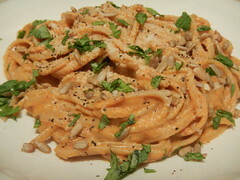 Stir tomatoes and feta into orzo, mixing until feta melts slightly. Season orzo mixture with salt and pepper. 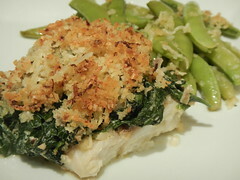 Serve with the chicken roulades and sauce. In Italian, saltimbocca literally means to “jump in the mouth.” And the combination of prosciutto, provolone cheese and sage are just that delicious! 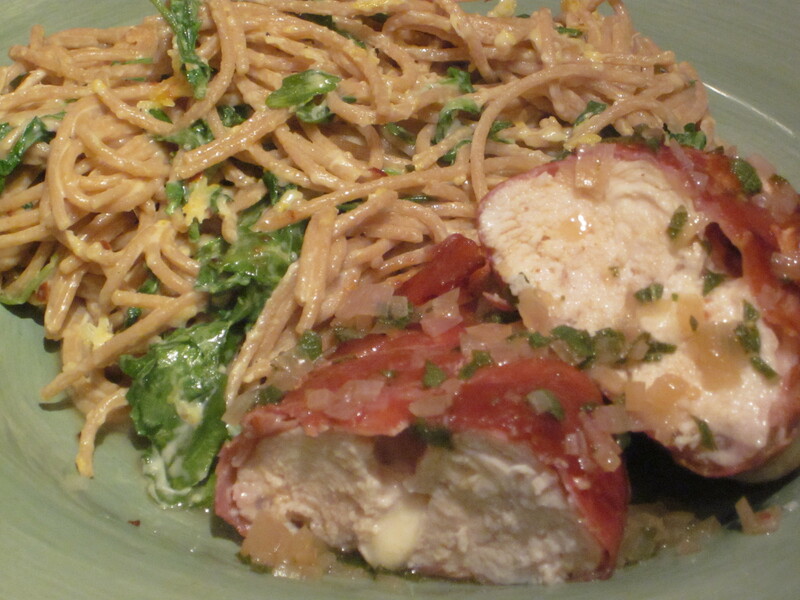 The pasta with greens compliments the classic flavors of saltimbocca too. 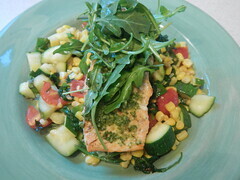 This meal doesn’t take as long as it may seem, but elicits a special feeling…great to make for date night! Preheat oven to 400. Bring a pot of salted water to a boil to cook the pasta, cover the pot with a lid to speed up the boiling time. Season chicken with pepper, cut a slit in each, then stuff with cheese. Wrap each breast with two overlapping slices of prosciutto. The slices I had were a little on the small side, so I ended up using three slices each. 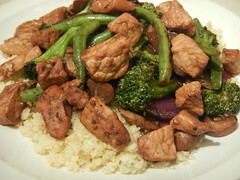 Saute chicken in oil and 1 tsp butter in a nonstick skillet over medium-high heat. Cook, turning to brown all sides, 6-8 minutes total. Place chicken bundles on a rack set on a baking sheet; transfer chicken to the oven for 5 minutes to finish cooking. Remove chicken and let rest 5 minutes before serving. When you put the chicken in the oven, work on the sauce. Saute shallots for sauce in 1 tsp butter over medium-high heat using the same skillet in which the chicken was browned. Cook until shallots are soft, about 1 minute. Deglaze pan with wine; simmer over high heat until liquid nearly evaporates. Add broth and lemon juice; simmer until liquid is reduced by half, about 3 minutes. Stir in 2 Tbsp butter and sage. When you take the chicken out of the oven to rest, work on the pasta (your pasta water should be boiling by now). Cook the pasta in boiling water for about 4 minutes. 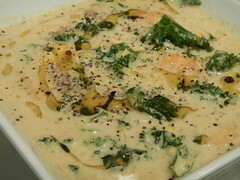 In a bowl, whisk together the cream, parmesan, egg yolk, zest, pepper flakes, salt and pepper – then top with arugula. Drain the pasta and add it to the bowl. Toss to coat pasta with sauce and to wilt the arugula. 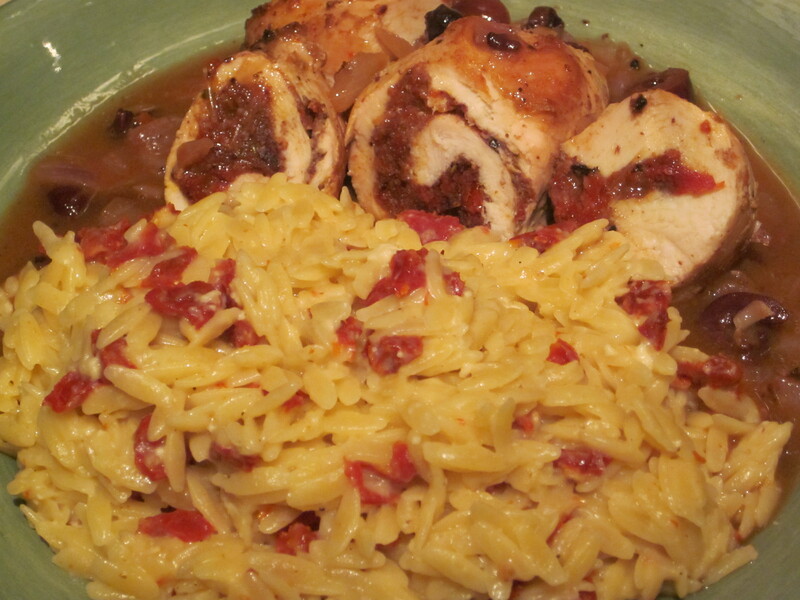 Place one chicken bundle on each of two plates; drizzle with sauce and serve alongside pasta. 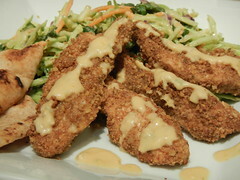 Slice each chicken breast in half horizontally to make 2 thin cutlets. Sprinkle lightly with water, place between two sheets of plastic wrap and pound until 1/4 inch thick. The chicken breasts I used must not have been as thick as what the recipe called for, because they were thin enough once I sliced in half. Either way, once you have them to the desired thickness, season with salt and pepper. Pour some flour into a shallow dish and season lightly with salt. Lightly beat eggs with the lemon juice in another shallow dish. Heat olive oil in a large skillet over medium heat. 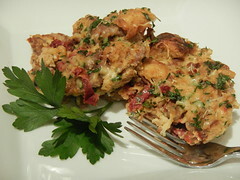 Dredge the cutlets in the flour, shaking off any excess; dip in the lemon-egg mixture, coating both sides. Add the cutlets to the skillet and cook until golden on the bottom, about 2-5 minutes. Add the sage leaves to the skillet, then turn the cutlets and cook until golden on the other side, about another 2-5 minutes (depends on the thickness – you want to make sure the chicken juice runs clear). 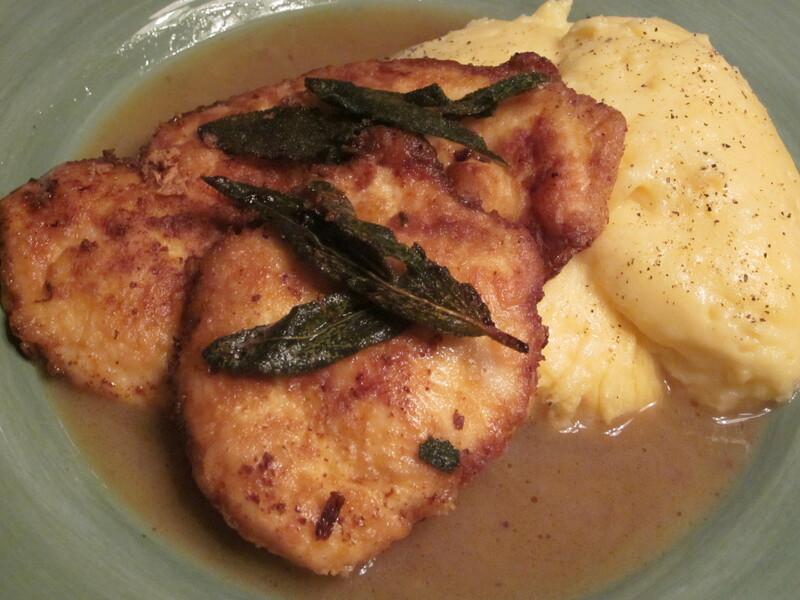 Transfer the cutlets and sage to a paper towel-lined plate. Pour out any remaining oil from the skillet. Add the wine and chicken broth and cook over medium-high heat until reduced by half, about 5 minutes. Add the butter and swirl until melted. Transfer the chicken to a platter or individual plates. 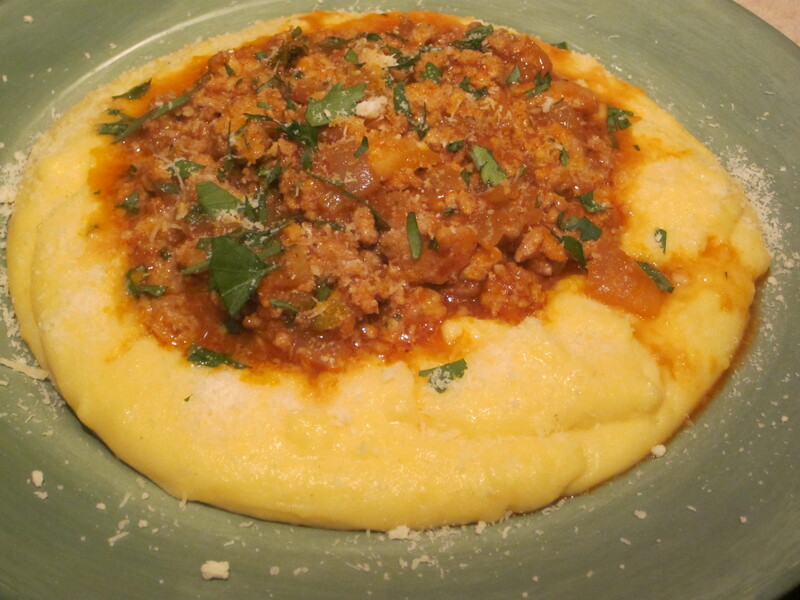 Serve along with the polenta recipe below and dress everyone with the pan sauce. Serve with lemon wedges if desired. Bring milk and broth to a boil in a saucepan over medium-high heat. Slowly whisk in cornmeal, reduce heat to low, and simmer until thick, 5 minutes, whisking constantly. Thin with water or more chicken broth if necessary. Off heat, finish with parmesan, oil and salt.